Electrons are negatively charged particles that form a principle component of matter. All matter consists of atoms, and atoms consist of electrically charged components--the lightweight negative electrons, and a positive nuclei. The word "elektron" in Greek means amber, the yellow fossilized resin of evergreen trees, a "natural plastic material" already known to the ancient Greeks. It was known that when amber was rubbed with dry cloth--producing what now one would call static electricity--it could attract light objects, such as bits of paper. During the 1800s it became evident that electric charge had a natural unit, which could not be subdivided any further, and in 1891 Johnstone Stoney proposed to name it "electron." Experiments, such as the "Edison effect" discovered by the US inventor Thomas Alva Edison (1847-1931), were important in determining the mass of the emitted particles, which became known as "electrons". 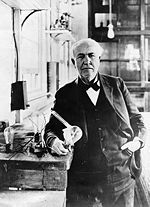 The "Edison effect" experiment involved a pumped-out glass bulb, in which an electric circuit is completed by electrons emitted from a hot wire. Edison patented the phenomenon in 1883 and many electronic devices use it nowadays. It turned out that they were rather lightweight. The simplest atom, that of hydrogen, contains a central positive particle, a proton, and a single electron, and the proton is nearly 2000 times heavier. Experiments with beams of negative particles were performed in Britain by Joseph John ("J.J.") Thomson, and led to his conclusion in 1897 that they consisted of lightweight particles with a negative electric charge, nowadays known as electrons. Thomson was awarded the 1906 Nobel Prize. William Gilbert, a physician who lived in London at the time of Queen Elizabeth I and Shakespeare, studied magnetic phenomena and demonstrated that the Earth itself was a huge magnet, by means of his "terrella" experiment. But he also studied the attraction produced when materials such as amber were rubbed, and named it the "electric" attraction. From that came the word "electricity" and all others derived from it. When J.J. Thomson discovered the light particle which carried that charge, the name "electron" was applied to it. The many applications of electrons moving in a near-vacuum or inside semiconductors were later dubbed "electronics." Periodic table showing blocks of elements with similar valence shell electron orbits. The configuration of electrons primarily determines an elements chemical reactivity, and particularly the outer-shell (or "valence") electrons. Because of this, the elements in the periodic table are arranged into rows (known as groups) based on how many shells of electrons an atom possesses, and into columns (known as periods) consistent with the number of electron in outer-shell. Because of the importance of the outermost shell, the different regions of the periodic table are sometimes referred to as periodic table blocks, named according to the sub-shell in which the "last" electron resides, e.g. the s-block, the p-block, the d-block, etc. See image at right. 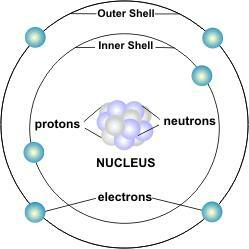 An electron shell is a group of atomic orbitals with a principal quantum number (n) of the same value. The maximum number of electrons that can be held in each shell can be calculated using the formula 2n2 where n is the shell number. Therefore, the first shell can hold only 2 electrons, the second 8, then 18, 25, 32, and 50. Electron shells are made up of one or more electron subshells, or sublevels, which have two or more orbitals with the same angular momentum quantum number (l). These orbitals are identified by the letters s, p, d, f, g, h, i, etc. Each orbital can hold a maximum of 2 electons and is distinguished by its unique shape. For example, S orbitals are circular, whereas P orbitals are dumbell shaped. These subshells correspond to the azimuthal quantum numbers (l-values) 0, 1, 2, 3, 4, 5, 6, etc. Each shell can hold up to 2, 6, 10, 14, 18, 22 and 26 electrons respectively, or 2(2l + 1) electrons in each subshell. In the ground state of an atom (the condition in which it is ordinarily found), electrons are found to occupy the lowest-energy level possible, and enter into higher levels in order of increasing energy. For example, the first electron goes into the lowest level, the second into the next lowest, and so on. This is known as the Aufbau principle. Chemists use a standard notation to describe atomic electron configurations. In this notation, a subshell is written in the form nxe, where n is the shell number, x is the subshell label and e is the number of electrons in the subshell. The periodic table at right illustrates the notation given to each element. These notations assume knowledge of the electron configuration in the lower energy levels. ↑ 1.0 1.1 1.2 History of the Electron by Dr. David P. Stern, "The Exploration of the Earth's Magnetosphere". National Aeronautics and Space Administration. Last updated November 25, 2001. This page was last modified on 20 February 2015, at 13:49.